Shining Blu-ray Ripper helps you copy Blu-ray Disc and rip Blu-ray movie to video and audio in 200+ formats (such as MPG, MPEG-1, MPEG-2, MPEG-4, H.264, H.264/MPEG-4 AVC, DivX, XviD, AVI, FLV, MP4, M4V, MKV, MOV, 3GP, 3G2, MTV, SWF, WMV, WMV-2, ASF, DPG, TS, DV, VOB, AMV, WebM and so on) for various media player and device like iPhone (iPhone X/8/7/6s/6/SE), iPad (iPad Pro/Air/mini 4), iPod, Samsung Galaxy Tab, Surface, Google Nexus, PS4 and 4K TV. I go by simplicity of installation, use and application. When I installed according to instructions, I ran the program an ditto simply said it doesn’t rip newer BluRay disks and to contact support. So it didn’t do what it says it does. The disk is clean and free of scratches and only 4 years old. Blu-ray or Blu-ray Disc is a digital optical disc data storage format. It was designed to supersede the DVD format, and is capable of storing several hours of video in high-definition and ultra high-definition resolution. The idea of ripping Blu-ray Disc to your PC is very much like ripping CDs and DVDs, except the fact that, Blu-ray has more copy protection than any other format around, and playing it on your computer can be difficult to impossible. There are many Blu-ray ripper tools available, not all of them work the same. Shining Blu-ray Ripper is a simple yet powerful Blu-ray ripping software application, that allows you to rip your Blu-ray discs. It allows you to rip Blu-ray quality movies, and also perform minor editing operations. The installer size is ~27MB, and the installation process is simple and straightforward, taking no time at all to complete. The application takes around ~110MB space on the hard drive. After launching it for the first time, the application asks you to enter the registration code to activate it. It can be easily activated and registered using the code and entering and email address. Once done, you can start using the application and the powerful tools that it comes packed with. The UI of the application is clean, simple, and has a modern design with colors and icons. All the buttons and features and arranged intuitively, so it shouldn’t be trouble to use it for any type of users, even the novices. At the top is the menu bar with the usual drop down menus, followed by the toolbar that contains buttons to important tools and features. 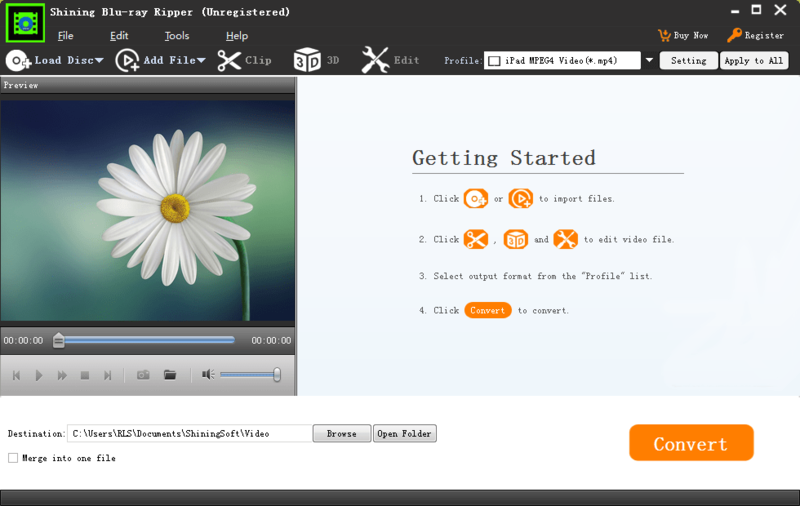 On the left side is the video player that allows you to preview the content you are ripping or editing. You can choose the profiles from the top-right, and also adjust settings of the profiles and save them as new. The destination directory can be changed from the bottom, and there is a ‘Convert’ button at there too. – Clean and Simple UI, designed to be easy to use for all types of users, even the novices. – Copy Blu-ray Disc and rip Blu-ray movie to video and audio in 200+ formats (such as MPG, MPEG-1, MPEG-2, MPEG-4, H.264, H.264/MPEG-4 AVC, DivX, XviD, AVI, FLV, MP4, M4V, MKV, MOV, 3GP, 3G2, MTV, SWF, WMV, WMV-2, ASF, DPG, TS, DV, VOB, AMV, WebM and so on). – Compatible with Windows 10/8.1/8/7/Vista/XP/2000 and Windows Server 2012/2008/2003. – Many profiles available, that include profiles with settings for many different types of devices. – The profiles can be edited and saved as new. – Also comes with some editing tools that allow you to add 3D effects, watermarks, image cropping, etc. – Post processing task, that allows you to shut down the PC after the processing is done. – Only available language in the UI is English. – Does not offer much configurations. Shining Blu-ray Ripper is a simple and easy to use application, that allows you to convert and rip Blu-ray discs and movies easily and efficiently. The application runs smoothly, without any lag or crashes. It is definitely recommended.